Colorado is the only U.S. state that lies entirely above 1,000 meters (3,281 ft) elevation. 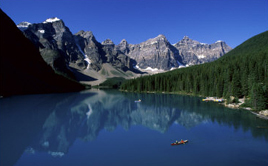 Colorado has more than 500 mountain peaks that exceed 4,000 meters (13,123 ft) elevation. Colorado has 4 national parks: Rocky Mountain National Park, Black Canyon of Gunnison National Park, Mesa Verde National Park and Great Sand Dunes National Park. There are also countless national monuments, national forests and scenic road drives. The Garden of The Gods in Colorado Springs has colorful rock formations. The Royal Gorge Bridge is the world's highest suspension bridge, hanging 1,053 feet above Colorado's wild Arkansas River. The world's highest cog railroad goes from Manitou Springs to Pikes Peak, elevation 14,110 ft. The state is rich in hot springs. In the lovely, scenic town of Ouray, visitors can relax in the hot springs after a day of hiking or skiing in nearby Telluride or Silverton. There are old western cities like Silverton from the era of the silver and gold rush. Visitors can enjoy plenty of activities: white water rafting on Colorado, Arkansas, Cache de la Poudre rivers; kayaking, hiking, biking, rock and ice climbing, skiing, jeeping, flying, horse riding, fishing, fly fishing.